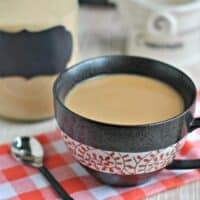 Another delicious homemade coffee creamer for you all to enjoy. The rich taste of Creme Brulee in this homemade coffee creamer is perfect paired with any dessert. This was a rough week in my kitchen. The weather around here has been absolutely horrible, overcast and rainy most days. Which, is normally nice, cuddled inside with a good book. But this week I had quite a few recipes I wanted (NEEDED) to work on. And on the one sunny day (Monday) I baked up two recipes. If you follow me on Instagram, you’ll see what happened. My first recipe was pumpkin cinnamon rolls. I made the yeast dough, it rose and looked awesome. I rolled it out, added my toppings and they were giant beauties. Stuck them in the oven, and that’s when it happened. After thirty minutes in the oven, I took them out. The filling leaked out all over the bottom of the pan and caramelized. Not necessarily a bad thing, until I took a bite of the cinnamon roll. They were the most disgusting things I have ever tasted. UGH. Instead of going back to the drawing board, because I only have a few hours left to bake and photograph in my prime sunny spot, I decided to just bake up some cookies. From a batch of cookies that I already had in my freezer. The first batch burned to a crisp. Oops. And the second batch I forgot to put parchment paper on my baking sheet and the caramel stuck like glue. So, I did what any good food blogger does. I drank a cup of coffee (oh, what, all food bloggers don’t relax with coffee?). 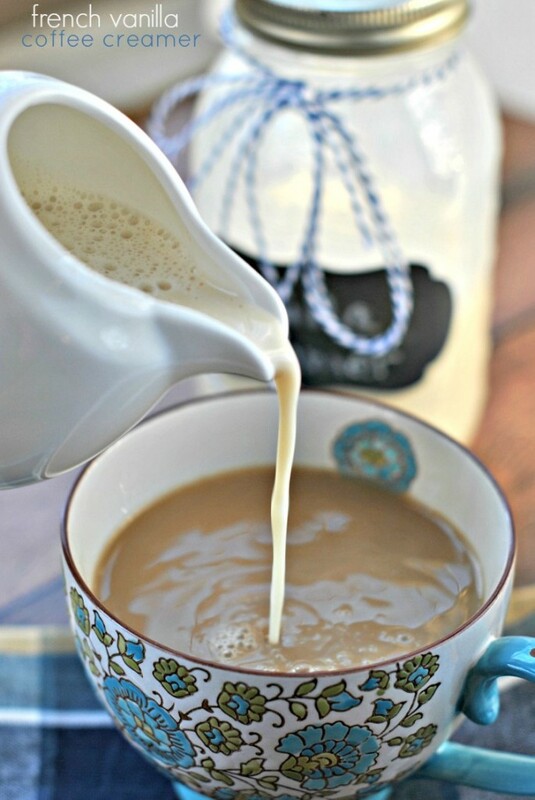 And while drinking my coffee I realized I can make a quick batch of homemade coffee creamer. Surely I can’t mess that up right. But, what flavor to make??? Last time I was at the grocery store I saw “Creme Brulee” flavored creamer. Have you had this? Oh my it’s delicious. Instead of using a can of sweetened condensed milk, I used a can of evaporated milk. I heated this up on the stove top for a quick minute with the brown sugar, just long enough to dissolve the sugar. Remove from heat and whisk in the vanilla extract and milk (I used fat free milk, but any kind would work great). You guys, the flavor of this creamer is incredible. I’m often asked how to make my creamers sugar free, for today’s flavor you can use a brown sugar substitute and enjoy! Now, time to get back in my kitchen and male this Cinnamon Cinnabon Cake. At least this time I’ve got some delicious coffee to give me peace! In a small saucepan, heat up a can of evaporated milk with the brown sugar. Whisk over medium heat until sugar is dissolved. Add your remaining milk (I usually use skim, but any will work) and vanilla. You can also substitute almond milk or coconut milk for the regular milk in this recipe. Pour into a mason jar, shake and enjoy. Store in refrigerator. Most large grocery stores carry fat free evaporated milk (or fat free sweetened condensed milk). You can also substitute stevia brown sugar substitutes for the light brown sugar. Instead of whole milk or higher fat milk, use skim (fat free) milk. You’ll love the flavor! Love Coffee Creamer? You’ve definitely come to the right place! 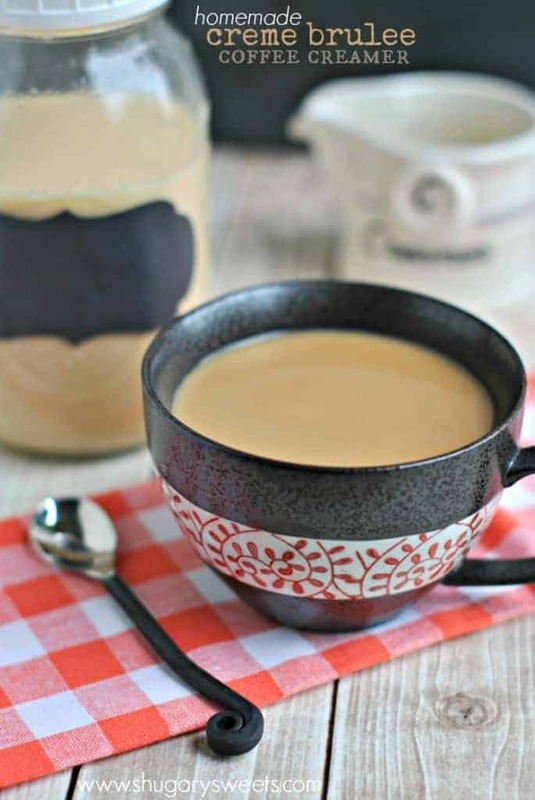 This French Vanilla Coffee Creamer is my most popular. It’s the base recipe of most of my creamer recipes! Turn your coffee into a pumpkin spice latte! 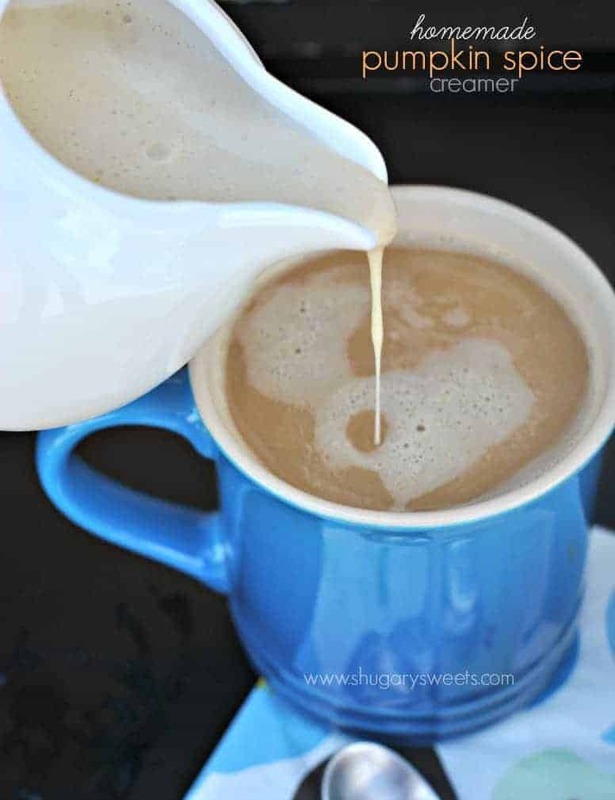 This Pumpkin Spice Coffee Creamer is perfect for Fall! 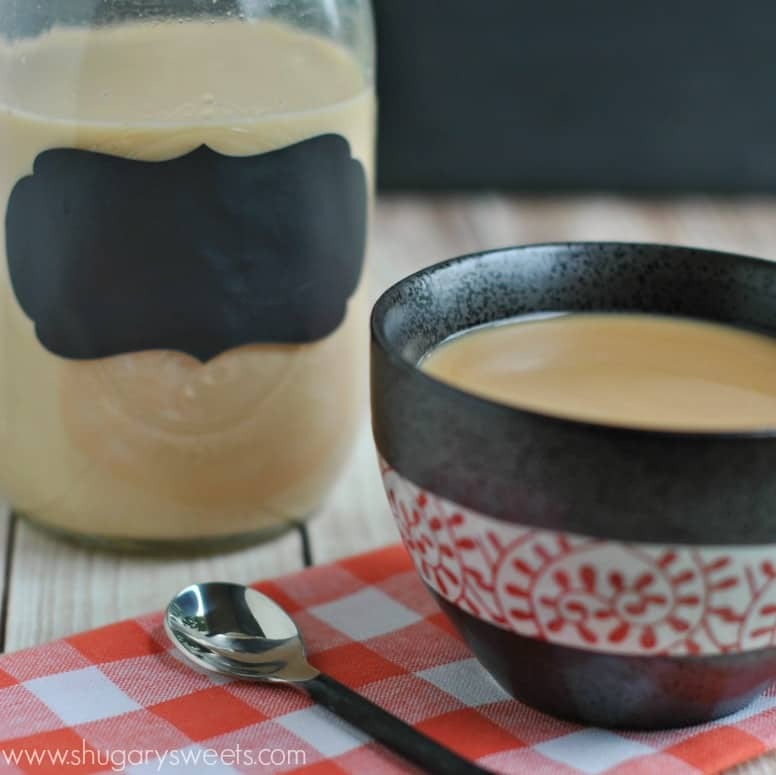 Easy, 4 ingredient recipe for homemade Creme Brulee Coffee Creamer. Heat evaporated milk and brown sugar in a small saucepan over medium-low heat and whisk until sugar is dissolved. This takes a couple minutes. Remove from heat and add the milk and vanilla extract. Pour into a large (quart sized) mason jar and refrigerate until ready to use. ENJOY!! To determine expiration date, use the date on your milk carton as your guide. This creamer will last in your refrigerator until the milk date. 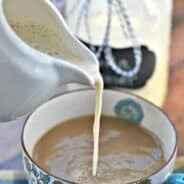 **This delicious Creme Brulee Coffee Creamer recipe was originally published on Shugary Sweets on August 30, 2014 and has been updated and republished in April 2018. Ugh, I feel your pain lady. Hate days like that. It’s raining buckets here today and I had planned on cooking/photographing. But I guess not anymore. No light in site! Love this creme brûlée coffee creamer! We’ve had some crazy rainy days here in Illinois 🙂 Hope your sun shines soon! Every Sunday morning we have a large family breakfast with the Aunts and Uncles, this will be a nice change. Ha, love that spoon too (thanks to World Market)!!! I hate those days when you are just not meant to be in the kitchen! So frustraing to waste all that time & money. Rainy days sound nice right about now the 95 degree heat and humidity have kept me out of the kitchen lately, I just can’t handle it!! If I were to drink coffee crememer this would be the flavor- sounds delightful! Oh yeah, sometimes weather just doesn’t cooperate with us food bloggers, LOL!! Yes, curling up with coffee is pretty much my favorite thing to do, rain or shine! This looks amazing. I have learned to drink my coffee black for calorie intake reasons ;), however my teens who have started drinking coffee would love it if I kept this in the fridge! Haha! I will occasionally drink it black, or with a non dairy creamer for that same reason. And yeah, my kids love my homemade creamers (the teens in their coffee, and the younger ones in their hot cocoa)!! Wow – this sounds sooo delicious! I love the thought of making my own creamer, so I know exactly what’s in it! Oh my word, that’s so funny – I just posted pumpkin cinnamon rolls today! I hear you though, I had a run last week of just awful tasting stuff, ugh. This creamer though looks fabulous! You make the best coffee creamers! This flavor sounds like the perfect addition to my morning coffee! 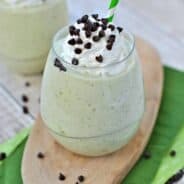 Can I make this recipe with almond milk instead of cow’s milk? is there a rcipe for creme brulee in a powdered creamer that could be stored outsde the refrigerator? I, too, would like to know if there is a recipe for Crème Brulee in a powdered creamer that could be stored inside or outside the refrigerator. Thank you!!! How much coffee would I use this with? I make a ton of coffee at once and fridge it for the week. I make pumpkin spice with actual pumpkin, go figger lol I make peppermint mocha with actual cocoa powder and peppermint EO. Im staying off Starbucks so Im not worried about sugar rly, Ive been cutting it as I adjust. This recipe looks good for my next coffee wish attempt…Creme Bruleé! Just curious, why the 2 different types of milk on the creme brulee recipe? Ooh, looks delicious! I’ve been feeling a bit more experimental with how I do my coffee so this sounds good! Will definitely make one for myself. Thanks a lot for sharing! I’m so glad that I found your recipe. I just found out that Bailey’s has discontinued their creme brulee creamer. I will try your recipe . 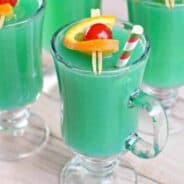 Actual recipe, with specific measurements? I can’t find. Soooooooo my teacher also feels the pain of a life without baileys creme burlee creamer, so i found this recipe, and i really hope its good cause if it is, she told me id be her favorite person besides her son, but above her husband. I’m yet another Bailey’s Creme Brulee REFUGEE! I made it two days without my creamer….and it looks like I found the right place! I don’t have instagram so I can’t show you, but I just made this and it’s delicious! 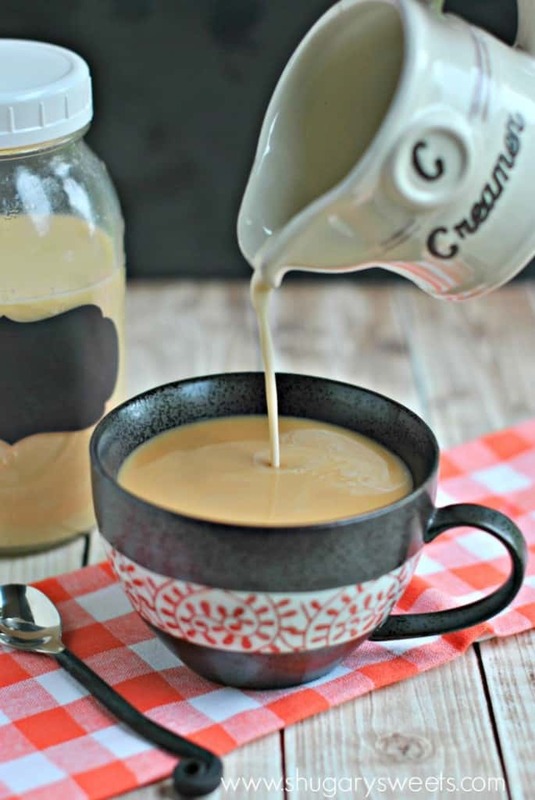 Pingback: Créme Brulee Coffee Cream (easy, 4 ingredient) / The Grateful Girl Cooks! I love creme brulee flavor!! I bet it’s a nice added bonus! What a great way to start my day! I’m going to have to try this tomorrow with my morning coffee! This looks heavenly! I can’t wait to add this to my morning coffee. Oh this is the best way to start your day! I need to make asap!